I’m a big fan of poetry, for young and old, and we are fortunate enough to have some fantastic and talented poets around to inspire and entertain children and adults. One such poet is the fantastic Brian Moses who has been writing poetry incredibly successfully for many years. 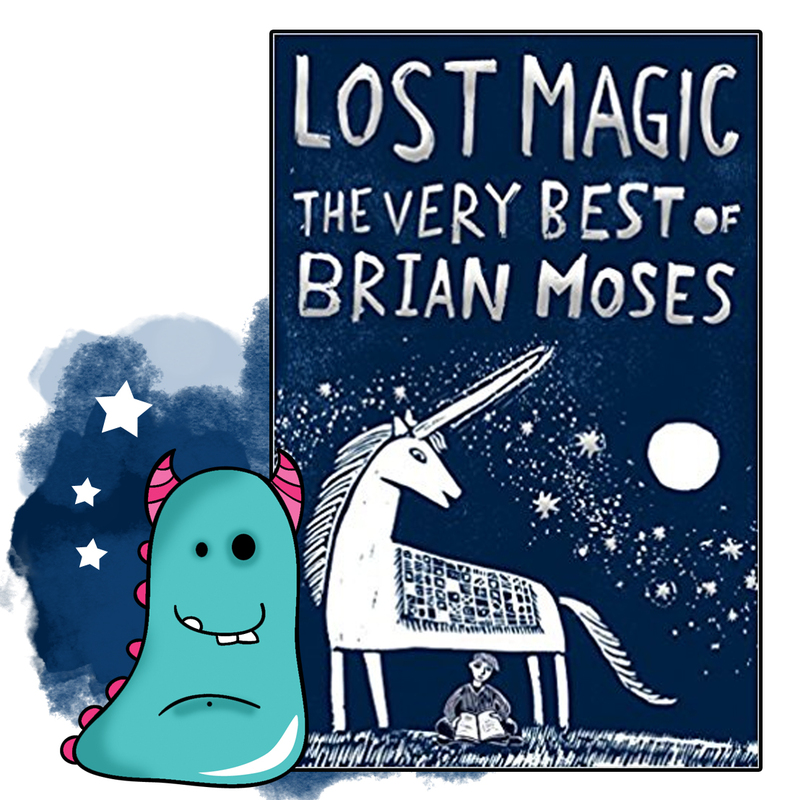 I was very fortunate that Brian offered to send me a copy of his latest anthology Lost Magic The Very Best of Brian Moses, Cover illustration by Ed Boxall and inside illustrations by Chris Garbutt and published by Macmillan Children’s Books. The first thing I have to say about this book, is that the production quality is absolutely wonderful. My edition is hardback (however the book is also now available in paperback), and it is gorgeous. With a shiny embossed cover which glints and shimmers and exudes the magic that’s also hidden between the covers. The quirky illustration on the front by Ed is stunning, and helps this book feel extra special. Within the book, the fun and quirky illustrations by Chris Garbutt are also fantastic. The whole thing is very nicely done, and really made me smile. This is a great quality book, rather fitting of an epic long standing poet such as Brian Moses. The headings separate the poems into nice sections such as spooky or ghostly poems, school life or history and much more besides, allowing you to pick and choose what you’re interested in. This is one of the brilliant things about non-fiction books and poetry books in particular. There is no need to read these books in order. They allow children to head straight to the areas which interest them most, inspire and excite children, rather than drag them through topics they don’t want to read about. It gives a wonderful reading freedom! The poetry itself? Well it’s brilliant of course! Brian has an ability to turn his hand to any subject and any style. The poetry in here plays with rhythm and rhyme, breaking convention, and showing children that poetry can be flexible, fun, silly, personal or serious. These poems celebrate nature, our planet, the absurd, the mythical and the magical. We are taken on a journey through life all in Brian’s unique voice. There is so much to love about this book. From an educational perspective, this book is a brilliant example of the diversity of poetry. There many different ideas and activities and discussion points within the poems making it a teacher’s dream. With over 100 poems to go on, there is so much to be used as a jumping board into discussion with children and their own poetry writing. I will give a mention to Brian Moses’ blog here too, as this is jam packed with brilliant and inspiring school poetry writing ideas, it almost makes me want to go back to teaching. Do check it out and use these ideas in conjunction with this glorious book. It would also make a brilliant one to read aloud to children in classrooms. The chapters about school and parents are particularly brilliant, and I can see children adoring the humour in these poems. What child doesn’t enjoy poking fun at their teachers? Although Book Monsters is a children’s book blog, many of the books I talk about could easily, very easily, make great gifts for adults, and this is a cracking example. Any poem loving grown up will enjoy this book, and it will look quite stunning on the bookshelves. Each very different poems, but all ones that I thoroughly enjoyed. But in honesty, selecting just three favourites was a near impossible task, because every poem in this book has something different and wonderful to offer. So read them all!! Read them on the train. when you dive into the sea. and recite to every tree. and show every single star. about the magic in this book. Lost Magic The Very Best of Brian Moses is available in paperback and hardback from all good bookshops and libraries now. Thank you for reading this poetic Book Monster review. Next Post The Joys of Writing!